For the last two weeks we've been looking after a frog for one of the co-op kids, X . X. has cleverly named the frog "Frogger." Frogger turns out to be really cool. You have to feed him live bugs, which turn out to not be so hard to catch, and if you wait patiently after you put the bug in his aquarium, you can see him zap it down. He eats almost any kind of bug, but seems partial to big dragonflies and spiders, which are especially easy to catch. Frogger's big problem is that the glass walls of the aquarium throw off his sense of depth. The one time I saw him try to nab a bug, he leaped boldly into the air, extended his tongue, and went “PLAM!” into the glass wall of his home. 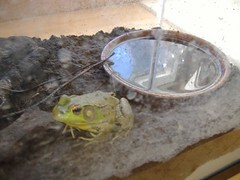 His tongue formed a little pink blob on the glass next to the green blob of his body. Poor Frogger.